With many new buyers to the Subaru brand performance enthusiasts are asking what’s the difference between the 2018 Subaru WRX and the 2018 WRX STI sedans, and which one should you buy? Here’s a detailed explanation of each. You can determine which is best after you see the differences. For under $28,000, you can drive the rally-bred Subaru WRX, a turbocharged, all-wheel-drive performance car, respected the world over. The higher-performance STI will cost you about $10,000 more. For the extra money, you get a bigger engine, more power, a performance-tuned suspension, and numerous other upgrades. Check out the many differences below. Both use inter-cooled, four cylinder, turbocharged Boxer engines with direct fuel injection and Subaru Dual Active Valve Control System. WRX 6-speed manual transmission uses a wide ratio spread and incorporates carbon synchronizers on first and second gears. Subaru enhanced shifter feel for the 2018MY 6-speed gearbox, with a new synchro design and reduced friction, along with smoother clutch take-up. WRX Automatic: Sport Lineartronic CVT with stepped manual and automatic shift modes controlled with steering wheel paddle shifters. The WRX STI is equipped exclusively with a specially reinforced close-ratio 6-speed manual transmission to handle the extra horsepower and torque over the WRX. No automatic transmission is offered. WRX: Uses a small lip spoiler. (Rear wing not available). WRX STI: Large Rear wing. Subaru says the rear wing on the STI adds 3 mph to top speed and increases stability at high speeds. (STI can be ordered with the lip spoiler). WRX: 18-inch alloy wheels, a new optional Performance Package for the WRX Premium features red-painted front and rear brake calipers with upgraded JURID brake pads. WRX STI: Features this model’s first-ever 19-inch wheels, and upgraded Brembo Performance Brake System using new brake pads, stronger mono-block 6-piston calipers in front, mono-block 2-piston calipers in the rear and larger, drilled rotors all around for better heat dissipation. WRX: Sport-tuned suspension. Rear: Double Wishbone lateral link with pillow-ball bushings. Front: Strut-type with aluminum lower L-arm with pillow-ball joints. WRX STI: Performance-tuned suspension. Rear: Double Wishbone lateral link with pillow-ball bushings. Front: Inverted strut, aluminum L-arm with pillow-ball joints. WRX: CVT models use Active Torque Split AWD system: An electronically managed continuously variable transfer clutch actively manages torque distribution in response to driving conditions, acceleration, deceleration and cornering. Slippage at the front or rear wheels causes torque to transfer (up to 100 percent) to the opposite set of wheels. WRX: 6-speed manual models use Continuous AWD system: A viscous-coupling locking bevel-gear center differential built into the transmission case distributes torque 50:50 front-to-rear. Slippage at the front or rear wheels causes torque to transfer (up to 100 percent) to the opposite set of wheels. WRX STI: Uses a Driver Controlled Center Differential (DCCD) AWD system: The higher-performance STI features a limited-slip, planetary gear-type center differential, augmented by an electronically controlled center limited-slip differential. This provides for a performance-oriented 41:59 torque split. This allows the mechanically limited slip differential to have a quicker response and activates just prior to the electronic limited-slip differential. For performance driving, drivers can control their fore/aft torque to optimize the distribution of power. 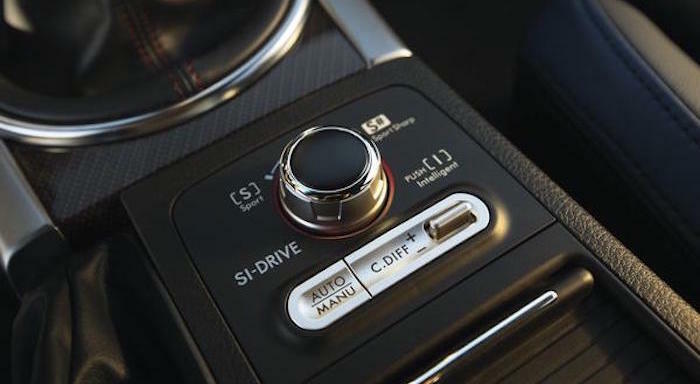 WRX STI: comes standard with MVDC for the driver to switch from Normal to Traction depending on conditions and when the driver wants more control and performance. It will allow the car to be driven closer to its limits. Both 2018 Subaru WRX and WRX STI performance sedans received revised styling, suspension upgrades, new available Recaro performance seats, and upgraded interior materials and a quieter cabin. Now that you’ve seen the differences, you decide which performance model better fits your needs and your wallet. You can build your own model here.